James Delingpole beats a Press Complaint from UEA | Watts Up With That? The University of East Anglia has made complaints to the Press Complaints Commission about three blog posts by James Delingpole (photo at left) in the Telegraph about Professor Phil Jones and the Climatic Research Unit (CRU) at the University of East Anglia (UEA, UK). I imagine that UEA may now be regretting making these complaints to the Press Complaints Commission, as it is now officially upheld in James Delingpole’s and the Telegraphs favour, with the reasons visible to any other journalist that may take an interest (my bold). Through its correspondence the newspaper had provided some evidence in support of the statements under dispute, and the columnist had included some of this evidence in the second blog post under discussion. The threat of, or taking legal action against critics of ‘climate science’ does appear to be on the rise, this is a concern as few bloggers have any means to defend themselves legally. If actions like this are not fought and won, all perhaps it would take is a lawyer’s letter from a complainant with deep pockets (like UEA) for the blog owner to have to make a difficult personal and financial decision. Additionally, these actions may result in a form of self censorship with blogger and journalists not daring to comment. How many blog owners or other journalists without the backing of an experienced legal team and the Telegraph would have been able to take this case on? James explains the help and support he had with this Press Complaint and I imagine the case was the cause of some stress and concern for him, (he perhaps has had cause to make his own complaint recently, see his BBC experience) as not winning could have potentially damaged his livelihood as a writer and journalist. “To its enormous credit the PCC stuck up for fair comment and freedom of speech. This is a massive victory not just for me and Telegraph blogs, but for bloggers everywhere – especially those doughty souls around the world who are battling against Establishment lies, bullying and cover ups to try to reveal the truth about the corrupt, mendacious Climate Change industry. I was completely unaware that this case was going on until I read about in James Delingpole’s latest blog post and it did make me think what I would have done if a lawyer’s letter found its way to my blog with a threat of legal action. So hopefully now, before ‘climate scientists’ and politicians rush to the courts they will now think more carefully of the potential outcomes. If only because it may backfire on them and that they realise as he won the complaint, others in the media might pay more attention to the reason why he won the complaint. The complainants, acting on behalf of the University of East Anglia (UEA), complained that three blog posts by James Delingpole were inaccurate and misleading and contained distorted information in breach of Clause 1 (Accuracy) of the Editors’ Code. They were concerned that a second blog post repeated accusations that had been demonstrated as untrue, concluding that the University’s scientists were “untrustworthy, unreliable and entirely unfit to write the kind of reports on which governments around the world make their economic and environmental decisions”, and a third blog post referred to the scientists’ work as “shoddy” and “mendacious”. The Commission emphasised that the articles in question were blog posts and were clearly identifiable as such to readers generally, as they were posited in the ‘Telegraph Blogs’ section of the website and written under the columnist’s prominent by-line. The Commission was satisfied that readers would be aware that the comments therein represented the columnist’s own robust views of the matters in question. Clause 1 (Accuracy) of the Editors’ Code permits the publication of such comment provided it is clearly distinguished from fact and does not contain significantly inaccurate, misleading or distorted information. “Can you delete any emails you may have had with Keith re AR4?”. “I’ve just completed Mike’s Nature trick of adding in the real temps to each series for the last 20 years (ie from 1981 onwards) and from 1961 for Keith’s to hide the decline”. In view of this, the Commission considered that there were some grounds for the columnist’s opinion – which readers would recognise was subjective – on these points. The complainants emphasised that Professor Phil Jones and the other scientists discussed in the blog post had been cleared by a number of independent reviews. The Commission noted that the columnist had referred to these reviews, and that readers would therefore have been aware that they had taken place. In the first blog post complained of the columnist had referred to “unconvincing attempts to clear the Climategate scientists”, and noted that one scientist, Mike Hulme, had “managed to emerge from the Climategate scandal smelling of violets”. He had also noted in the first blog post that Professor Jones had granted interviews “presenting himself as a man far more sinned against than sinning”. The columnist in the second blog post complained of had expanded on his comments and made clear that the scientists had “apparently… been ‘exonerated and cleared of all malpractice by a series of independent reviews’”, although he made clear that he did not consider these reviews to have been “independent”, citing a report by Andrew Montford which was critical of the reviews. While the complainants had expressed concern that the Montford report was “partisan”, the Commission considered that the columnist was entitled to agree with the report. The Commission was satisfied that readers would be aware of the context of the columnist’s robust views – clearly recognisable as his subjective opinion – that the scientists were “untrustworthy, unreliable and entirely unfit to write the kind of reports on which governments around the world make their economic and environmental decisions”, and that their work was “shoddy” and “mendacious”. In the circumstances, it did not consider that there had been a breach of Clause 1 (Accuracy) of the Code. The Commission noted that the newspaper had offered the complainants an opportunity to respond on the blog post. It considered that this would inform readers of the full context of the dispute and the complainants’ position. The Commission welcomed this offer, and hoped it would remain open to the complainants. James Delingpole only told the truth. If UEA do not like it then they should make sure that future outpourings re. climate change fits in with observable data not some altered to fit the model data that they seem to prefer. The Climategate Email saga tells it like it is. Wow! This is very good news and not only makes the UEA ashamed, in one time, the exonerations by the different commissions were sent to the waste bin. I hope that this helps to prevent further legal attacks by the UEA and others, as these are clearly abused to silence any critics. It appears “Climategate” still has legs. If only Gillard, in Australia, would pay attention to real information rather than the “climate economics” she receives from Ross “Gold Mine” Garnaut. there will be NO discussion..
and they want their word to be law, and unquestionable. that brand of dictatorship is outta style. So in the UK at least, you are now allowed to officially refer to Professor Phil Jones as “disgraced, FOI-breaching, email-deleting and scientific-method abusing”. It is also now OK to describe scientists from the University of East Anglia as “untrustworthy, unreliable and entirely unfit to write the kind of reports on which governments around the world make their economic and environmental decisions”. James Delingpole referred their work as “shoddy” and “mendacious”. But be aware, the Press Complaints Commission in the UK is not a ‘legal’ body as such, but its word does carry an enormous amount of weight and respect. It appears to me that scientific arguments, particularly around AGW, have been supplanted with legal arguments. It is permissible to suppress evidence contrary to one’s case, provided it can be done legally. One might interview several expert witnesses, but only use the testimony of that expert who strenght’s one case. That is not how science should be done. The AGW alarmists come across more and more as facists as time goes by. Which is good news, the Bear suggests. Afterall, facism and its innovative `school’ of public relation (a.k.a. `propoganda’) was somewhat discredited as a result of that little kerfuffle, commonly known as WWII? I should also add that I believe James Delingpole to be the first journalist to release to the world news of the climategate emails, on November 20, 2009, whilst the BBC, who had the information first, were busy trying to suppress it. Well done James and enjoy your break. It is just wonderful to see James Delingpole coming up smelling of roses. Well done to him and the Telegraph. We want this to go away, disappear, so we’re going to make a big stink about it……. All coming from a group of people that have shown zero common sense in the past. If that came out of England, then there is hope for Freedom. If any AGW sceptic bloggers find themselves needing a legal defense in the US, they may want to try and tap into the Alliance Defense Fund (ADF). Yes, I know this is a Christian nonprofit organization, but James Dobson, one of the founders, is very much an AGW sceptic. This is only a thought. Of Delinpole he won as he was merely speaking the truth. Americans should be asking why they pump tax dollars into the coffers of the CRU. In Britain, we can’t do anything about it, we do not live in a democracy. In the States, you guys however can put a halt to and stop most of the funding going into the CRU and thus – you have the power: to put a stop to Jones’s AGW promotion agency. Of course Delinpole he won as he was merely speaking the truth. The Canadian Free Press should learn something from this… to defend their writers against bullies. James Delingpole and Christopher Booker are the only two MSM columnists in the UK who have consistently argued the non-AGW case and the need for the scientific method to be returned to its former place as the gold standard of science. They have done so with great clarity and logic, and evidence based statistics. James and Christopher have been confronted by an unscrupulous opposition who have never, to my mind, demonstrated that the evidence they so frequently cite is explicitly linked to CO2 being a specific cause for their doom-laden prognostications. I congratulate James on his legal success and salute both of them for their integrity. Dr Tim Ball is next out of the chute, but doesn’t have the financial support that James had. I hope that he takes encouragement from James’s success and that it encourages more people to contribute to Dr Ball’s fighting fund. A victory for free speech and common sense. Congratulations to James Dellingpole. Hopefully, such tailwind may help Dr. Ball and others who speak out the truth. Will this in any way, shape or form help Dr. Tim Ball? What amuses me most is that the crew at UEA thought that mentioning the whitewashes was a point in their favor. Oops, maybe someone at the PCC reviewed them, too. To be fair it was only because he said it on a blog. If it appears in a newspaper articles it may be different. I hope Mann tries to bring his Penn. State whitewash into court. It is still unimaginable to me that the UK, one of the places on earth where the idea of freedom of speech first blossomed, is now a place where you need an official government commission to decide if you should get sued or not for exercising that right. ……taking legal action against critics of ‘climate science’ does appear to be on the rise…..
‘Skeptics’ have wanted to bring global warming out into the light of day in a court of law. Here it is, what they wanted. It’s being brought to them. They better take advantage of the opportunity. Otherwise they should not complain later after the opportunity passes. My father put on the uniform in 1939, and set off to North Africa in 1940. He fought his way across North Africa, Sicily and Italy and came back home in 1946. He did this so that we could share his vision of a free pluralist democracy. He left his young wife and new baby to save the world from tyranny. This greenshite appals me as it would have him. Where can I get a rifle? Extremely important and well said. If ever so-called “climate scientists” were actually scientists, it is now clear that they have no interest in science but an intense interest in legal maneuvering, pushing their political agenda for profit, and intimidating the rest of us. I do hope they keep this up. I believe they are stupid enough to do so. If they do keep it up, then in the American election of 2012 no Democrat will be elected to any office, the EPA will be abolished, and the UN will be escorted offshore. In Britain, where an interest in freedom of speech is nostalgia, at least most of the time. I find the Commission’s repeated use of the word “robust” to be delightfully ironic, and wonder if it wasn’t used specifically for that reason. It seems the UEA emboldened by their recent rigged whitewash inquiries began to labour under the misapprehension that they were untouchable, it appears that arrogance and conceit played a big part in their downfall. The establishment assistance has limits, it seems the UEA failed to recognize this. From their point of view they must have viewed the rigged inquires headed by establishment stooges as meaning that they could take the fight to their enemies and would receive the same kind of covering support from the PCC, they were wrong. All the UEA have achieved is to paint a giant sign telling of their guilt and in fact if they wanted on some level to accelerate the final day of judgement they could not have done it more efficiently. The UEA must have believed that the rigged whitewash inquiries provided them with a kind of immunity from criticism, it obviously didnt, indeed it couldnt and sceptics could have told them of this simple and obvious fact. In fact all too soon the UEA will realise that far from being a supportive mechanism, the rigged inquires will in the end be the agent of their downfall. It is not the crime that gets you its the cover up after the fact and this is all too true for the UEA. Other inquiries will follow as surely as the dawn it is simply a matter of time, the establishment that protects them now will not sacrifice themselves for the UEA, they are living on borrowed time and do you know something? I rather think they know it deep down. I find myself in the position of pitying those at the UEA, Its obvious how this is going to end, it was obvious on the day climategate was brought to the worlds attention. All the fake inquires in he world cannot change the eventual outcome. I wonder why they didn’t avail themselves of this golden opportunity to put things right? It is a good policy for bloggers to always invite their adversaries to comment. I know WUWT has done this on a number of occasions. Lets hope, too, that other juridictions can use The Telegraph’s reponse as a precedent. Message to all “reasonable” CAGW believers. Put the issue of AGW science aside for a moment and think about the tactics now being employed by the CAGW leadership: (1) the suing in a Canadian court of Dr. Ball by Michael Mann, (2) a quasi-legal attempt by the UEA to chastise James Delingpole, (3) and the most ludicrous of all, an attempt to suppress WUWT articles on FACEBOOK by labeling WUWT an “abusive” BLOG. If you’re reading this comment, you know WUWT is an eminently reasonable BLOG and Anthony treats, and requests that commentors on his blog treat, CAGW commentors with courtesy. Even better, contrast Anthony’s treatment of CAGW commentors on WUWT with Real Climate’s treatment of AGW skeptic commentors. Since I asked you to forget the science for a moment, pondering these matters won’t (shouldn’t) change your position regarding the science of AGW; but by all that’s reasonable, it ought to affect your opinion of the CAGW leadership. Remaining silent about the tactics of your leaders reminds me a little bit of the German people remaining silent during the Nazi rise to power. Speak up. Let your leadership know that even though you agree with the science of AGW, you deplore their tactics of trying to suppress any and all contrary views. Otherwise, no one will be there to defend you when the “thought police” come after you. I am pleased to have seen the PCC evaluate the evidence and come to the correct decision. This approach is increasingly novel in our world. So good for them and thanks to all who stood up for James Delingpole. I imagine he is very relieved. Looks like UEA just found out what the word independent means when you don’t pay 139,000 pounds to redefine it. Good post Barry. Having writting a short post about it last night too (here) I wish I’d been a bit more extensive – you did a much better job (although I did use Donna LaFramboise’s great pictures of James Delingpole, taken in Chicago last May at the Heartland Conference). I wonder if the UEA would consider running courses for the public on climate change? In particular a course showing how IR radiation from cold greenhouse gases in the atmosphere can increase the heat in the already warmer ground below? This is great news, another point for the side of reason and freedom. Very frustrating to think that it is us EU/UK taxpayers that are funding the UEA nonsense, not just the science but the legal attacks on the truthful too, shame it isn’t from the ‘scientists’ own pockets! A small but significant victory for open, honest science. Anyone who has followed the story understands the total failure of the whitewash inquiries which failed to investigate anything and I, for one, am amazed that no one faced criminal charges after the climategate revelations. I hope Jones was forced to pay the court costs out of his own pocket and not out of the pockets of the British taxpayers. Yes Christopher Simpson, I noticed that too – it gave me a wry smile. And to compliment this significant victory I have an ongoing PCC investigation into the Sunday Times – regarding their continual reference to electric and hydrogen vehicles being ‘zero emission’ and ‘Green’. I also have one ongoing with London Transport, for their misleading advertising. They wrote back recently and explained that their literature was correct, that their hydrogen busses are emission free and much more efficient than their diesel busses. But this reply totally ignored the whole point of my complaint – so I have made a formal request once more, for details on where their hydrogen comes from, and the energy costs of production. Perhaps they have discovered a hydrogen spring at the foot of the Chilterns,* who knows…. I also made a complain against Prof David Mackay for his bogus claim that electric vehicles were five times more efficient than fossil fuel vehicles. ** Prof Mackay has apologised if this statement could be ‘misinterpreted’. But it was bound to be misinterpreted by the vacuous reporters we have in the press and media – just as was intended, in my opinion – and the Sunday Times took the quote hook line and sinker. The Sunday Times has sort of apologised for being duped by the misleading professor, but as ever the retraction was 1/50th the size of the original article, and so the public probably still think electric cars driven by our current electrical grid are clean and are efficient. The Greens must not be allowed to get away with this deliberate misinformation, deception and propaganda. Hit them whenever you can, via any of the complaints departments and organisations. * Low hills outside London. ** The professor’s original statement fails to take electrical production losses into account; compares lightweight electric vehicles with an average of all cars, big and small; and compares specialist electric vehicles with ‘off the production line’ fossil-fuel vehicles. If we compare like with like (instead of apples and oranges), the electric Aptera car does 190mpg equivalent, while the VW-1L diesel does 280 mpg. A modern European turbo-diesel will always be more efficient and more green than an electric vehicle – until the electric grid goes 100% nuclear, that is. The Aptera figures use those peculiar US mpg units, so you will have to convert them to UK mpg. The Climategate affair led to the accused being exonerated yet the statement about “deleting emails”, “hide the decline” and “Mike’s trick” leave us bemused. And climate is just one area where the “science” leaves many of us wondering….on 9/11 high rise steel framed buildings collapsed to fire when aviation fuel burns at circa 1800f but steel does not melt until it gets to around 2750f. Puzzling…..and that was cleared by a Commision of Enquiry. Me thinks that there is quite a disconnect between what the Establishment tells us and what actually happens. Funny how the 9/11 hijackers were mostly Saudi but we attacked Iraq…..how very strange. Bit like modern climate science….you know something is not quite right but can’t quite put your finger on it and must not say anything. Well done James and so glad you stuck to your guns and used the help at hand…. others may not be so lucky. After another six weeks offline thanks to my ISP accidentally disconnecting me, I can respond again to those old familiar tugs at the heartstrings that have kept me here with friends for the last three years. I care about Truth. And I am British. And btw although we have a glorious history concerning freedom of speech, please don’t ever forget that most if not all of the glorious items wer born in the murky uncertainty of adversity and not knowing whom one could trust. Magna Carta: look up King John. Church of England: Anne Boleyn paid for it with her life. Parliament as we know it today: Queen Anne had to flee for her life from her own father who was king, and as Queen spent all her time sitting with the politicians so that one side should be always balanced against the other – because she knew that royal power as it had been, would end with her death. Quakers: born through the prisons. Even Churchill’s power of speech came as a late reward for his lifelong fight against a speech impediment; his ready wisdom and courage in the real moments of need came out of years of battling being belittled and ignored. Don’t underestimate what adversity can do to strengthen people of goodwill. James Delingpole and Christopher Booker are, to my knowledge, the only UK journos who consistently challenge the warmist/alarmist agenda, including the physical evidence of state-supported lunacy; wind farms. All others seem to swallow press releases at face value, which is a pretty damning indictment of the traditional stance of the fourth estate; investigation to establish the truth. In that regard,it is worth reminding readers that it was an exhaustive investigation by ‘Daily Telegraph’ reporters, over many months, which uncovered the scandal which was the total abuse by UK MPs of their expenses system, which in turn led to jail terms for the worst culprits. More strength to James and Christopher; keep at ’em – we badly need a dose of sanity back amongst our political servants – and those that advise them..! Isn’t WUWT’s free speech great? If I posted a comment like yours on realclimate or climate progress, it would never get past the moderation censors. I know, I’ve tried many times. Congratulations go to James for his victory. I especially enjoy James’ “robust” opinions. James, keep it up! Love your column, love your attitude. Welcome back, Ms. Skywalker. Have missed your pithy and concise comments of late. Regarding Google–I refuse to use it. Regarding the UEA, they invoke my disdainful laughter. And regarding James D., I’m mighty glad he’s won this round. I do believe Dr. Ball will benefit in the long run from this pronouncement. Mann’s as clueless about his chances in court as he was when constructing certain fictitious graphs. Finally, regarding “realclimate” and “climate progress”, I use quotation marks to emphasize the meanings of those words are NOT at all accurate in the current context. you make a really excellent point. What words of wisdom will emerge through the lense of history (even ten years) as a legacyof this battle? What would have thought of a win by the UEA in this case? What is it they would have succeeded in accomplishing? I think it would have been a successful suppression, with costs, of an expression of opinion. You surely didn’t mean to tell us you support that, did you? I agree with Delingpole’s assessment, similarly thousands of others who bother to find out the facts and circumstances. The Facebook thing is desperation to the point of farce. That Jones fart should count himself lucky he don’t live in France, since French work ethics and moral laws concerning everything bullying in the work place is a criminal offense with 3-10 million euro in fines and up to several years in prison, even if he just was the boss of the ones committing the offenses. In particular a course showing how IR radiation from cold greenhouse gases in the atmosphere can increase the heat in the already warmer ground below? It absorbs Radiative energy from the black body and radiates half back and half away. With a constant input of 1 watt, the black body will eventual radiate 2 watts to the molecule which will radiate 1 watt back and 1 watt away. Don’t confuse this with the second law of thermodynamics which refers to thermal energy or temperature/heat. Thermal energy is kinetic by nature whereas radiative energy is electromagnetic. So what are the chances of getting this on to the Wikipedia ‘climategate’ page? It sounds to me as if the Press Complaints Commission having read the same evidence the inquiries were supposed to appraise, have effectively saod that the inquiries could not honestly justify the vindication they gave the UEA. It seems you believe CO2 GAS is a BLACKBODY!!?? I fail to see this as a victory. The Press Commission has grudgingly admitted that James Delingpole has not transgressed. That is it. To win a hard fought battle for the right to be able to say something that is blindingly obvious on the most cursory inspection is not much of a victory. If anything, it shows how much of a battle still remains. That does not stop me from rejoicing on Mr.D’s behalf and congratulating all involved. C’mon! And what does exposure to 1800f do to the tensile and shear strength of structural steel? It doesn’t have to melt to fail. If the twin towers had been built to UK structural codes they would likely still be standing. But of course we’ve had to allow for terrorist attacks for many years. Just because the promotion of cAGW has conspiracy elements doesn’t mean that it is primarily a conspiracy. The dogma, incompetence, malice and greed are actually the main drivers. But I don’t think Anthony will welcome them being aired here. And (being qualified in Structural Engineering) I can tell you that your point on steel’s melting point is nonsense. The warmer ground below is the black body and the gases are the molecules. The 1 watt constant input is solar radiation received by the black body and it is that, that is radiated too the gas. “Cold” is relative condition. A molecule that has lost some energy through collision can still radiate back a lesser energy value than it is receiving. Hm to me, you are on the best way to describe a perpetuum mobile, a source of countinuous energy out of nothing. And the 1 watt comes back again and again and again? Duplicating, triplicating, heat etc? It does not work like this, please re-think your greenhouse gas theory, there are several good explanations on the web, or you may want to read “Slaying the sky dragon”. Strangely, nothing of the ruling has appeared on the BBC, the Independent, the Guardian or the UEA’s websites. To date, this has not been mentioned anywhere in the British MSM. …Had the ruling gone the other way, it would have been plastered all over the British media and no doubt given wall-to-wall coverage on the BBC with the usual demands for inquiries, suitably groveling apologies, resignations, and heads-on-platters all round. Notice also that a careful reading of the PCC’s statement destroys all the credibility of the findings of the inquiries into the Climategate fraud, which have now been officially proved to have been nothing more than establishment whitewashes. Excuse me, but I thought perfectly legitimate comments were allowed on this site. Clearly, a sense of fascist censorship has become established here when a word like fr@ud can’t be used without getting the whole post deleted. Shame on all censors. Tell me, are you censors really moonlighting from the Guardian’s cif operation? continue this chat in more detail. Always something new to learn. Your not reading what I said properly. I said with a constant input of 1 watt. The constant input is the solar radiation transformed by the black body into LWR and radiated out toward the molecule. The molecule absorbs the 1 watt and radiates half away and half back. In the next instant the black body receives 1 watt from the solar input and half a watt back from the molecule so the black body now has an energy value of 1 and a half watts which is propagated too the molecule and so on. This is known as reverberation and is part of the wave theory of electromagnetic energy propagation. I have simplified it into “instances” but it happens over a short time span with the energy between the black body and the molecule increasing until the energy output of the molecule away from the black body is equal to the solar energy input too the black body. and start a guest post or register, all are welcome. Would be happy to continue this chat in more detail. I’ll be happy to discuss these concepts in detail but I won’t make a guest post. Sceptics need to have a greater understanding of science than the politically driven frauds that infest our universities. Use my post to Lars P for a more detailed discussion on the concepts of radiative feed back. I’ll look in and see if we can’t learn from each other. We’ll see how the UEA squirms out of this contradictory mess. Martin, what you describe is very interesting. Let me try to think further. Supposing we have a 1 Watt source of energy in the mid of CO2 gas. When we send 1 Watt to the right, it comes back as 0.5 Watt (+ 0.5 Watt goes further). It goes past our source to the left as 1.5 Watts and comes back as 0.75Watt, (0.75 goes further). It goes now as 1.75 to the right and 0.875 is reflected back, 0.875 goes further. After full reverberation chain we have an effective source of 2 Watt in the middle that heats the gas. If we think now up and down, back and forth we get 6 Watt instead of 1 Watt. Wow! If we put the heating bulb in C02 we get 6 times more energy out! Supposing we have a 1 Watt source of energy in the mid of CO2 gas. No we don’t! We have only the source at the black body. You don’t get to set the rules. We don’t have convection nor evaporation or the flying spaghetti monster. The perfect black body has no mass, it is a legitimate theoretical construct. We are looking at a thin one dimensional plane so there is no scatter and no bypassing the wave propagation. Now re-consider your idiotic extrapolations. MartinGAtkins, Richard111. Nitpicking maybe, but I quibble over “Thermal energy is kinetic by nature whereas radiative energy is electromagnetic”. Surely it’s not the electromagnetic versus kinetic “nature” that distinguishes work from heat, but the predictability versus randomness? A radio transmitter delivers work into its antenna, some of which does work on my receiver’s antenna. 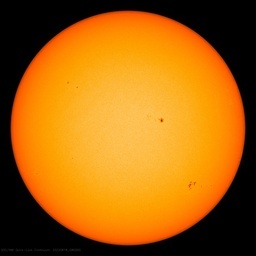 The Sun delivers heat into space, some of which does heat on my backyard. Both are electromagnetic radiation. The Sun delivers heat into space, some of which does heat on my backyard. Both are electromagnetic radiation. No…the sun radiates a broad spectrum of electromagnetic waves at high energy levels. Only when these waves are absorbed do they become heat. If you were in space and you faced the sun, the front of your body would rapidly burn whereas the back of your body would be very rapidly cool. As for your back yard, yes it will re-radiate electromagnetic energy because all matter has an electric field and so when it stretches bends or vibrates it sends out pulses. Heat and temperature are the actual movement of the gases components and have kinetic energy due to the mass of the atom or molecule. Electromagnetic energy has no mass or at least none to speak of. “No we don’t! We have only the source at the black body. You don’t get to set the rules. We don’t have convection nor evaporation or the flying spaghetti monster. No, Martin, there is no use to continue discussion with you.